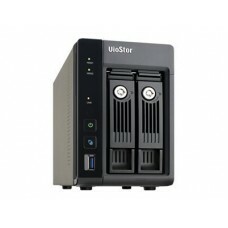 The QNAP 2-bay VS-2204 Pro+ VioStor NVR, available in a tower form factor with 4 channels, is designed micro-size with rich functions to convey high cost-efficiency for SMB and SOHO users. Compact but fully loaded with advanced features, the VS-2204 Pro+ series supports Full HD 1080P Local Display, built-in alarm GPIO for enhancing security management, QSCM Lite for central management of multiple NVRs, and more. Powered by a Quad-core Intel® 2.0GHz processor(burst up to 2.41GHz) and energy-efficient 4GB DDR3L memory, the VS-2204 Pro+ delivers quality performance with up to 180 Mbps throughput to ensure steady recording from multiple megapixel IP cameras. 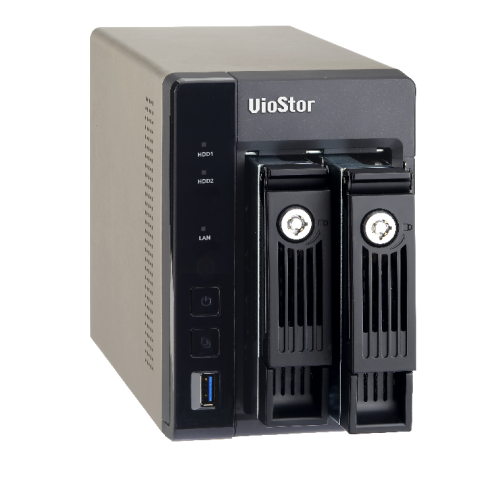 The VS-2204 Pro+ supports Single/ RAID 0 (disk stripping)/ RAID 1 (disk mirroring)/ JBOD/ Linear configurations and hot-swapping to allow replacing hard drives without interrupting system operations. QNAP’s advanced RAID recovery technology also assists if any healthy drives are accidentally removed from a degraded RAID volume. The system can be recovered to degraded mode by reinserting the wrongly removed hard drives so the data can still be accessible. The Global Hot Spare function also allows a drive to automatically replace a failed drive in a RAID volume, preventing data from being lost. Even without a PC, the VS-2204 Pro+ can be configured and perform monitoring tasks with the local display technology by connecting a USB mouse, USB keyboard and HDMI monitor to deliver lag-free live video monitoring in Full HD (1920x1080) resolution. QNAP local display technology provides a straightforward way to reduce the total costs in your business environment. With QVR system, users can easily manage & monitor multiple IP cameras in a real-time basis using web browsers, and attain the first-hand status of monitored corners. You can directly adjust the PTZ (Pan/Tilt/Zoom) functions of supported cameras, flexibly monitoring every desired corner and detail. Auto-cruising is also supported to allow you to define preset positions for PTZ cameras to automatically adjust their monitoring angles to preset positions by the time interval. You can directly configure IP camera recording schedules when needed without leaving the Live-view page, maintain a seamless monitoring so you won’t miss any suspicious events. You can also visualize IP camera deployment with the E-map function. Just upload the pictures of the monitored locations, drag and drop the IP camera icons to the right place on the E-map, and you can easily monitor your surveillance deployment at a glance. Qstart simplifies system initialization and network switch control for users to experience effortless NVR installation and remote maintenance. While providing quick initial setting in few clicks, Qstart integrates major functions of PoE switches and can set up camera IPs automatically. Users can easily manage PoE or network on/off and monitor devices status and network traffic flow. Its intuitive GUI and event notification allow for precise failure detection and efficient troubleshooting. QVR 5.0 provides flexible options to set up IP camera recording, including manual recording and scheduled recording. What can be even more convenient, you can set up the system to only record when motion is detected or other events occur. The smart recording function can also automatically switch the recording detail to a higher resolution when alarms are triggered. This greatly saves the cost spent on hard drives. How to find suspicious alarm recordings from huge amount of recordings can be a challenge. QVR 5.0 provides an intuitive playback interface to you to easily distinguish between regular and alarm recordings in the timeline bar. For greater efficiency, you can also enable Intelligent Video Analytics (IVA) to quickly search videos corresponding to particular modes (includes motion detection, foreign/ missing object, out of focus, and camera occlusion) to screen for critical recordings. The transcoding capabilities of the VS-2204 Pro+ allows users a practical solution for watching videos stored in centralized locations via the Internet when they have low-bandwidth connections. This feature adapts to bandwidth limits and/ or devices that lack the hardware or codecs to play video files by converting a video file to a lower resolution before transferring it across the Internet. The original high definition video is still retained without any changes being made to it, balancing the whole surveillance system for local recordings and remote playback. Unlike traditional NVR software that can be hard to use, QVR 5.0 is free from complicated options and terminology, offering an innovative desktop design to compliment smooth working efficiency. The multi-window design allows concurrent multi-tasking, and enables administrators to easily switch between tasks to increase their productivity. QSCM Lite is a free app provided by QVR that allows you to easily deploy up to 16 QNAP NVRs and 256 cameras and conduct central monitoring, playback, and management. 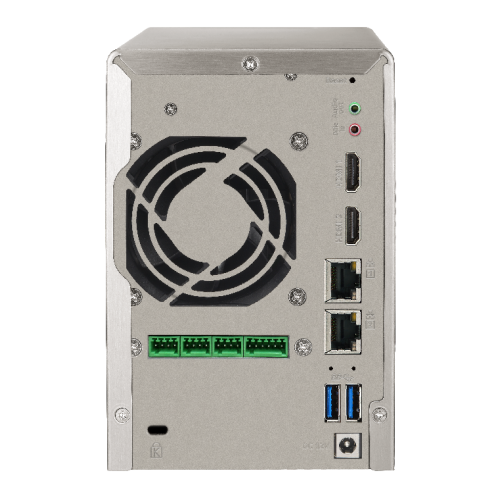 With no extra server hardware required, QSCM Lite can easily turn the VS-2204 Pro+ into a CMS server. The powerful and pioneering QSCM Lite can be freely downloaded from the integrated NVR App Center. Vmobile is an official mobile app that enables you to monitor QVR anytime, anywhere. Using iOS and Android devices, Vmobile provides camera live-view, PTZ control, instant event notifications, video snapshot, video playback, and searching for videos by date and time. Another mobile app, Vcam, allows you to turn your mobile device into a network camera and to directly save recordings to your VioStor NVR for portable surveillance options.